Public electrical accidents are mostly as a result of cutting trees near high voltage electrical power lines; and stepping on, touching or getting into contact with fallen power lines. As it is difficult to tell whether a power line is live or not unless measured or detected by instruments, the public have fallen prey to electrical accidents because of the assumption that once the wires are down they are switched off. The causes of industrial and residential electrical fire accidents is generally due to overloading of electrical circuits with too many appliances or too large of an appliance causing more current to flow in it than that for which it was designed. Electrical fires are caused by the heat generated due to the passage of the electric current, the heat being sufficient to ignite flammable material, liquid or gas. Always hire qualified electricians: Poor wiring of your house can cause fires. Loose wires are dangerous: Visible cables should be encased in a PVC sheath with no signs of damage, cracking or splitting. Damaged cables should be replaced as they can spark fires. 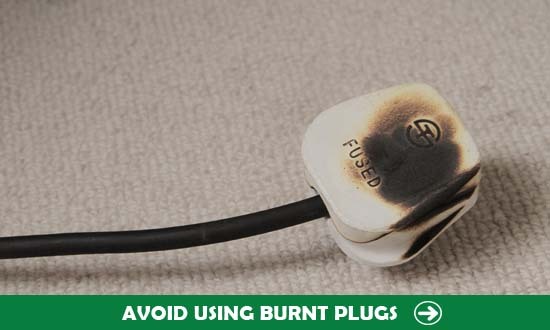 Replace plugs and sockets when they are damaged, display burn marks or produce excessive heat. Do not overload any socket or adaptor. Overloading a socket or adaptor can cause the socket or adaptor to overheat and catch fire. Install extra sockets or buy extra adaptors where you have many appliances. Teach children not to play with electricity.